'CADSM1' was created on 2004/08/24. patch12.zip supersedes all other patch1*.zip. What is the difference between 'freeCAD' and CADSM? What are the features of CADSM? How to download, install and try CADSM? How to purchase and register CADSM? How to version check, quick test and quick start CADSM? Where can I get help with CADSM? Are there any reviews or articles? CADSM is a basic 3D CAD with advanced Motion Simulation capabilities. It is suitable for anyone interested in learning 3D CAD and Motion Simulation inexpensively before using more sophisticated packages. Its motion simulation capabilities are comparable to the best and can provide accurate answers to engineers and scientists in diverse fields. Educators, students and new engineers will find it ideal for the teaching and learning of geometry, kinematics, dynamics, vibrations, mechanisms, linkages, cams, machine design and physics. The program runs on Windows, Linux PC, Macintosh PPC and other Unix's. Assembly data are unchanged across platforms. CADSM is a commercial software with a free evaluation period. If you use this software after the 30-day evaluation period, a fee of US$24 per machine is required for a perpetual license and a one-year subscription to upgrades and web support. Get 20% discount for two subscriptions and up to 60% discount for more. 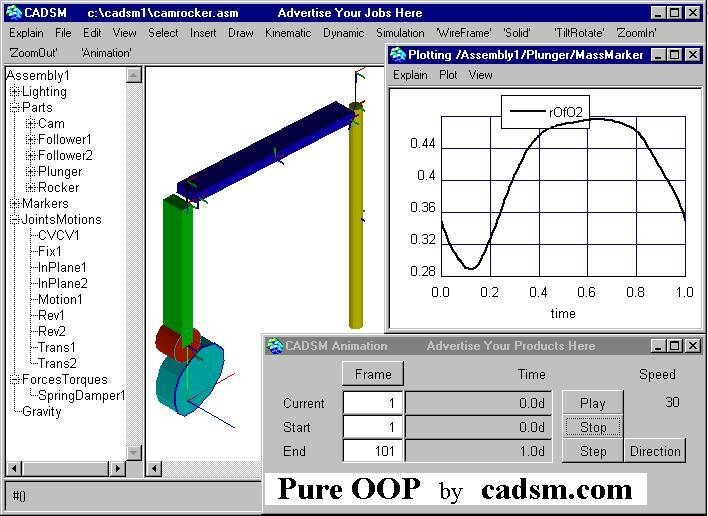 CADSM allows users to create and manipulate assemblies of parts. The parts are simple 3D solids, which can be connected by joints, constraints, contacts, motors, actuators, springs, dampers, forces, torques or gravity. DXF files can be imported for use as parts. The parts and connections define the structure, mechanism or machine of interest. Both open and closed 3D loops are permitted. 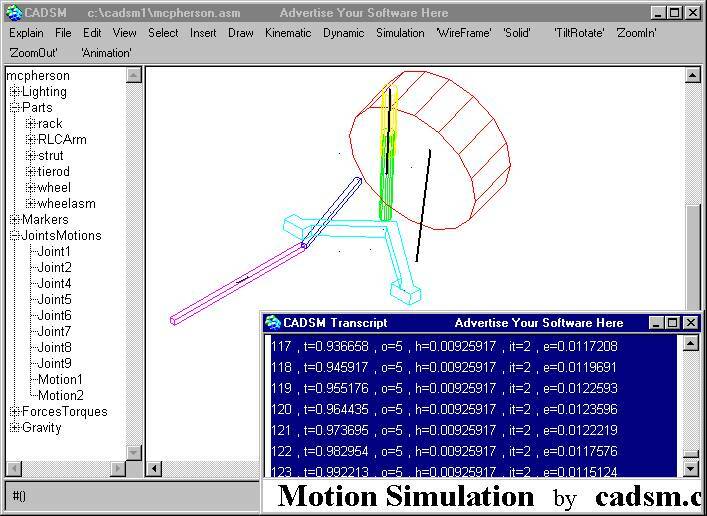 CADSM performs full Multibody Dynamics analysis on the assembly to predict the motion according to Newton's Laws. Animation using the simulated data produces realistic dynamic behavior of the system. Users can study the mechanical dynamics in the form of plots and tabular output. XY plots can be zoomed and set to equal scales. Data series available include linear and angular displacements, velocities, accelerations, forces, torques, momenta and kinetic energies. Acceleration data include transverse, centripetal and Coriollis accelerations. Users can view forces and torques from joints, constraints, actuators, springs, dampers, applied forces and inertia. Data can be exported to spreadsheets or POVRay, a ray-tracing program. CADSM has the following extras: color, rendered graphics, 6DOF actuator, DXF file import for parts, faster upgrades and web support. CADSM is a US$24 commercial software with a free evaluation period. CADSM is capable of full 3D pan, zoom, tilt and rotate on an assembly of parts in wireframe or rendered graphics. Parts can be solids or DXF file imports. Available solids are extrusions of rectangles, circles, ellipses and polygons. The parts can be positioned and oriented exactly in space, as are markers on the parts. Exact specification of linear and angular velocities of parts in space are also possible. Mass and inertia properties can be user specified or automatically computed based on uniform density. Available joints are spherical (ball), revolute (pin), translational (slider), cylindrical, planar, fixed, universal, point in line, point in plane, parallel, perpendicular, no rotation, constant velocity, rack pinion, screw. Both open and closed 3D loops are permitted. The curve-curve contact allows liftoffs and collisions based on coefficient of restitution. Available actuators are rotational, translational and full six DOF. Their motions are user prescribed functions of time. Forces and torques are user prescribed functions of time, displacements and velocities in all three components or along connecting markers. Example formulas for spring, damper, bushing, beam, aerodynamic, inverse square law and other forces and torques are given. Available functions are sqrt, exp, ln, lg, sin, cos, tan, arctan, arctan2, spline, spectral density. Users can specify constant gravity of arbitrary magnitude and direction. CADSM can compute kinematic, quasi-static or dynamic solutions for any interval of time going forward or backward based on the assembly and user requests. It does redundant constraint removal automatically and nondimensionalizes the equations for improved accuracy and stability of models that are microscopic or gigantic. Simulation progress is animated and the simulation can be stopped any time. After simulation, the computed solution can be used for animation or frame by frame analysis. Full 3D pan, zoom, tilt and rotate is available during simulation and animation. Users can obtain engineering data in the form of plots and tabular output. XY plots can be zoomed and set to equal scales. Data series available include linear and angular displacements, velocities, accelerations, forces, torques, momenta and kinetic energies. Acceleration data include transverse, centripetal and Coriollis accelerations. Users can view forces and torques from joints, constraints, actuators, springs, dampers, applied forces and inertia. Fourier tranforms of all times series are available. Individual parts can be save into files and reinserted into any assembly repeatedly. Assemblies can be saved in binary or human readable, tab delimited, text format with notes and simulation data for later reload. The text format allows pre and post processing of assemblies by other programs, especially spreadsheet programs. Other specific text formats are for MOSES, PDMS Review and POV-Ray. CADSM runs on Windows, Linux PC and Mac OS/X. Assembly data are unchanged across platforms. CADSM has the following extras: color, rendered graphics, 6DOF actuator, DXF file import for parts. Try CADSM first. To use CADSM beyond the 30-day evaluation period, please purchase a perpetual license and a one-year subscription to upgrades and web support for US$24 per machine at Get 20% discount for two subscriptions and up to 60% discount for more. Then email to askoh@cadsm.com attaching the file 'install.bos' located in the subfolder 'resource' in the folder containing CADSM. When payment and 'install.bos' are both received and verified, a new file 'register.bos' will be send to you to include in the 'resource' folder. CADSM will then run with a perpetual license. To see license agreement click CADSM License Agreement. Since CADSM can be downloaded from many locations, it is good to check that you have the latest version. 'CADSMx' was created on yyyy/mm/dd. Also check that your have the latest patch for the version. Click File/Open/Assembly/ to get a list of example assemblies. If necessary, Click Edit/Marker Size/ to set marker sizes suitable for the drawing. You can click any View menu item and drag the tilt and rotate handles, even during animation. Close animation window when done. Click Explain/Quick Start/ to learn how to build a model from scratch. Together, the tutorials demonstrate the available features in CADSM. This patch is for CADSM1 created on 2004/08/24 only. Inside CADSM, click Explain/About/Patch/ to see if you need the patch below. Download patch12.zip (1,426,182B) into the directory containing CADSM1. Unzip patch1*.zip Let it overwrite other files. Then launch CADSM as before. Inside CADSM, click Explain/About/Patch/ to see that you have the patch installed. Documentation are inside the program. They are collected in a series of menu items labeled 'Explain'. Click on them anytime. But you MUST run the 'projectile.asm' and 'circular.asm' tutorials to learn CADSM. Inside CADSM, click Explain/Quick Start/ for a list of tutorials on projectiles, circular motion, relative motion, pendulums, spring-masses, four-bar linkage, piston-crank, gyro, cam-follower. Please report any problems. Let me know if you can make the installation process easier. If an error message comes up, click on "Continue" to let Smalltalk recover. You can usually continue if you avoid the offending steps. Every error is logged in a file called error.log. Email that file to the author for debugging. Patches and workarounds will be posted as soon as possible. Thank you in advance. On some machines the submenus may not open reliably. Move the cursor out of the menu item through the side and reenter from the side. Check that the download files have the exact number of bytes shown above. Use Winzip to unzip cadsm1.zip and patch8*.zip. CADSM cannot run from CD-ROM or write protected media. Copy the cadsm1 directory and its contents to a writable hard disk. 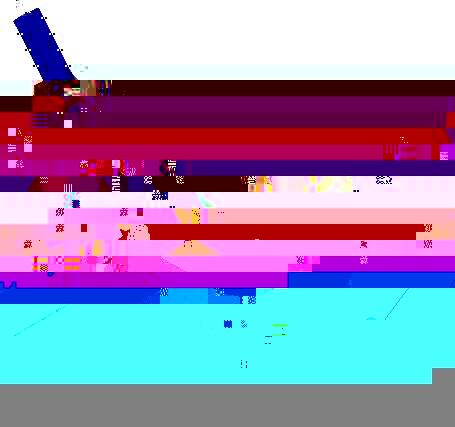 No graphics is displayed. Exit CADSM. Rename the files in folder \resource\bin\ from (opengl32.dll glu32.dll) to (xopengl32.dll xglu32.dll). Restart CADSM. Right clicking on some mice does not bring up the correct menu. Try right clicking while holding the ctrl key down. On Windows 98, the help dialog for motion and force-torque dialogs will not close when the X button is clicked. Close with ESC key. On machines with low memory, desktop icons may become white when CADSM exits. Reboot to recover. Internet Explorer 5.5 seems to be the cause. Upgrade to Internet Explorer 6. If resizing the window is very slow to repaint, disable 'Show window contents while dragging' found in Start/Settings/Control Panel/Display/Effects. File dialog always opens to A: drive. CADSM does not recognize networks. Run it from a local harddrive. Animation is jerky when the graphics window is very large. Reduce the window size. This is the first release of CADSM. CADSM is not open source. An open source of similar capabilites is StCAD: 3D CAD Framework for Smalltalk. Your bug reports and suggestions are most valuable for improvements in CADSM. If you have example assemblies to share so that others can benefit from your work, please let me and others know about them. I can include them on this site if you want. If you like programming, I welcome you to look at the open source and discover the wonders of pure object oriented programming and the productivity gains that can be had. Finally, but not least, please tell your friends and colleagues about CADSM. Thank you very much for your contributions. To uninstall, just delete the cadsm* directory and its contents. CADSM does not change any settings on the computer. CADSM is provided 'AS-IS' with no warranty as to its use or performance. By using it, you agree to indemnify the author from any liabilities that you may incur from the use of the software. To see license agreement click CADSM License Agreement. Copyright (C) 2000-2004, A-S Koh, All Rights Reserved.